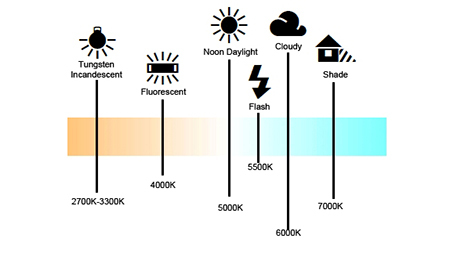 Color temperature (or Kelvin Temperature) refers to a portion of the scale of the visible spectrum of light that is variable as viewed by the human eye (and camera imagers). In film and video recording, Kelvin Temperature is used to determine a 'white point' for the camera. When this white point is set, either by inserting the appropriate Film Stock, or by setting the 'White Balance' of the digital camera, any object that is white in color will appear as a correct shade of white as opposed to a having an orange/red or blue/cyan hue. The two basic concepts in film and video regarding color temp and white balance are the standardized settings of 32K (3200 Kelvin) and 55K (5500 Kelvin). The scientist Kelvin is credited with the discovery of color shift relating to light/heat output in stars and the same concept applies to film and video light entering the camera. This concept is confusing to many people as there are different ways to describe the 'white balance', 'Color Temp' or 'Kelvin Temperature' and how to adjust it. For starters, in film/video, all three of the terms mean essentially the same thing. As an example, if you have a warm light and a cool setting on the camera, the Kelvin point of the light is a low number such as 32K. The cameras white balance setting may be higher somewhere around 55K . This will make a white object or human person on-camera appear orange to the viewer. The phrase used to correct this setting is to "cool down" the person that is seen as orange or warm on-camera. However, color temp settings must be raised numerically to make the person appear normal. The camera setting must go from 32K to 55K which is an increase in numerical values, but the phrase spoken on-set is to "Cool them 'down'" in order to make the person look less orange. Someone not familiar with the technique may confuse the phrase "cool them down" with a decrease in numerical value in the Kelvin Temp scale. This would make the person on camera look even more red-orange that they had in the first place.